Peanut butter is hands down tasty delicious, but it’s also pretty calorically dense. Just two tablespoons of peanut butter will set you back around 200 calories — which is one of the reasons it’s counted as a teaspoon in the portion-control containers used in SHIFT SHOP and many other Beachbody On Demand programs. 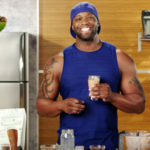 So, if you’re a peanut butter fan like Chris Downing, this Peanut Butter Cinnamon Smoothie will satisfy your peanut butter craving without going overboard on the fat and calories. Instead, Chris uses powdered peanut butter and adds cinnamon for an extra dimension of flavor that helps bring out the smoothie’s peanut buttery-ness. Learn more about the SHIFT SHOP Proving Grounds Workouts here! This healthy peanut butter smoothie made with powdered peanut butter, cinnamon, and Vegan Shakeology is sure to satisfy those peanut butter cravings! If you have questions, our friendly advice staff are waiting for you in the Beachbody on Demand Community Boards “Expert Advice” section. There, you’ll find registered dietitians, certified fitness professionals, and other experts ready to tackle the trickiest fitness and nutrition questions. And, if you’re looking to connect with others who are also doing the SHIFT SHOP, head on over to the SHIFT SHOP community boards!